The arrival of the equinox later this month (21st) makes September the perfect time to discuss light. In nature, orchids grow in light levels from direct tropical sunlight to the dimmest light levels found on dense forest floors. Hobbyists read about these orchids and expect that they can also grow their orchids in similar situations. There are several reasons why this approach does not work. Hobbyists need to remember that most of the hybrids they find for sale likely arose from less than 50 of the 30,000 species found in nature. In most hybrids, less than ½ dozen species are in the background. These parent species are almost all tropical epiphytes, with the exception of the Paphs. 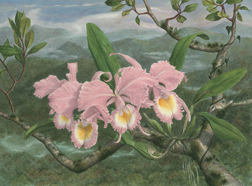 Epiphytes or tree-dwelling orchids grow in relatively high light in the highest branches of trees. While species in nature can be found in a variety of light conditions, they usually flower best in bright filtered light levels and not in full strength sunlight. The best orchid growers duplicate these light levels. Light is the fuel that orchids use to grow and flower. If there is too little light an orchid will use all of its energy to grow and will not flower. There are some exceptions to the rule, most notably, the tendency for orchids to produce large numbers of flowers just before dying. In cases such as this, something is killing the orchid and as a consequence, the orchid puts all the energy it would normally use for growth into one last reproductive effort. Orchids flower best when they are exposed to ideal conditions and when the plant is mature. An orchid reaches maturity when there is enough energy stored in leaves, bulbs, and roots to initiate the development of tissues that produce flowers. Typically, this is a seasonal event, triggered by plant hormones, but always dependent on energy stores. Larger orchid plants always produce more and larger flowers than smaller plants if all other factors are the same. Why won’t my orchid bloom? This is a frequently asked question. If the orchid has leaves and a good root system the answer is almost always “light”. Dark leaves or elongated growth and/or leaves usually confirm low light as the cause. Unfortunately, the usual response by hobbyists is to increase fertilizer levels. While orchids and other plants do have some ability to adjust the density of chloroplasts that capture light or to produce thin leaves so more light gets through, there is a lower limit below which orchids will grow, but not flower. While this may be fine for Jewel orchids, grown for leaves and not flowers, it is not satisfactory for most orchids. How does the orchid hobbyist determine the amount of light that their orchids are receiving? This is not easy without complex instruments, but there are some simple ways to evaluate light levels by simply noting how many hours a day direct light hits a plant. Chances are it is far less than the 12 hours of daylight during the equinox. Indoor growers expect light limitation, but the light may be just as limited in some areas of a greenhouse. Some of the best grown orchids showing up at judging tables these days were grown indoors under full spectrum lights. The development of high intensity sodium or halogen light fixtures made this possible. With these lights, it is possible for plants to receive 100% of the maximum light they can use for 12 hours each day. In a greenhouse, that level would only be reached for a brief period each day; often less than half the light delivered by a full-spectrum system. There would be even less light if houses, trees, or overhanging plants blocked light for some portion of the day. Remember, also, that the angle of the sun changes during the season, but not with full-spectrum lights. Some greenhouse growers supplement light with high intensity light systems turning them on in early morning or late evenings. In winter, there is the extra benefit from the waste heat from the lights. Windowsill growers often do the same with florescent lights providing afternoon light in an east facing window. Orchids that get some natural sunlight and florescent light as a supplement will flower fine, while florescent light alone will not usually produce as many flowers. All light bulbs, including the full spectrum lights, lose their ability to produce the full range of light listed on their packages after a certain length of time. Gro light florescent bulbs produce their specified wavelengths for just a short time, while some of the Halogen lights are supposed to last six months before they lose their vitality. Recall that only the red and blue wavelengths of light activate plant chloroplasts and lead to plant growth. If you want orchids to flower like they do in the orchid magazines they must have light.